President Major General (Ret’d) Jioji Konusi Konrote warmly greeted Rotary International President Ian Riseley and commended the Rotarians for their support for community development and transformation. “Their support of community development is indeed special because they have helped to mobilise a heightened community spirit that has empowered and transformed the lives of many ordinary members of society,” Major-General Konrote said. The President said this while welcoming Mr Riseley to Fiji at an event on Thursday night at the Grand Pacific Hotel in Suva. 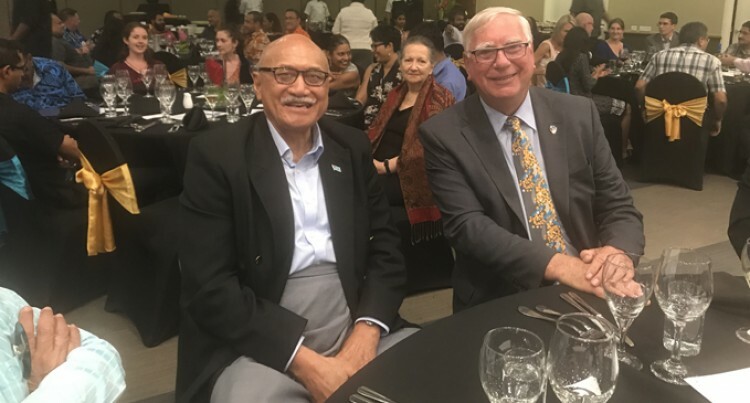 “As a Rotarian during my term as Fiji’s High Commissioner to Australia and concurrent Ambassador to Singapore, I am fully aware of the role of Rotary International in community development,” he said. Major-General (Ret’d) Konrote said he was aware that Rotary International for supporting Fiji for decades since the first Rotary Club in the South Pacific was established in Suva in 1936. He said the Rotarians provided much-needed relief and rehabilitation assistance immediately after Fiji copped the wrath of the strongest cyclone to make landfall in the Southern Hemisphere – Category Five Severe Tropical Cyclone Winston, early last year.